The fact that I get so much done often comes up a great deal in my clinic as I spend a great deal of time coaching my patients on achieving a better life balance. For some this involves making the time to exercise or eat right. For others it means establishing better sleep habits, or changing the manner in which they approach work, stream lining it to be more effective. But it comes up a lot - how on earth do I get so much done when I have the same 24 hours everyone else has? Well I figured I'd pull back the curtain and show you, exactly how I get done what I need to get done and how I do it. 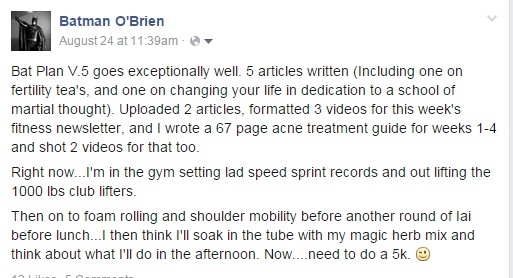 I'll also give you some tips and insights into key tools I use to maximise my time and what I can do with it. Here's a sneak peak example - I probably use a different keyboard layout to you. Much of the structure of my day comes from my understanding of Bushido (the Japanese Way of the Warrior) and the principles handed down in the koryu bujutsu and heiho (the strategy and art of war in feudal Japan). Strangely, many of the principles found in these arts - which I strongly recommend everyone study - line up exactly with the principles taught in many of the cutting edge and leading business, productivity and time management seminars I've attended with leading experts like Eben Pagan, Tim Ferris etc. I actually teach these methods in detail to my patients, and I'm developing a course on the same as part of my Samurai Strength program - if, after reading this article, this is something that interests you further, you can always ask me about my online coaching and mentorship programs and of course about the upcoming program I'm putting together on these methods. Just leave a comment below. It is these methods that have let me live the incredible life of personal and financial freedom that I enjoy. So there a couple of interesting things here. Firstly I spend less time working than I do training and relaxing in my study of martial arts. It's an ideal balance. On average I spend 4 hours relaxing and chilling out, I spend 4 hours and ten minutes on training and spend about 6 hours and 10 minutes a day working. Secondly, I break my work up into distinct phases. I work for 50 minutes, then I take a 10 minute break in either a physical or emotional mode. I repeat this cycle and then take a longer 30-60 minute break. Eben Pagan refers to this as the 60/60/30 Solution. There's a lot of reasons behind this, but suffice to say for now, this is the optimal way of working. Super focused bursts of 50 minutes, followed by a complete break where I engage in a totally different mode of being. Thirdly, I exercise - briefly and frequently. There is NOTHING more engendering of success in nearly any sphere than movement. Every single major CEO, entrepreneur and leader in industry and innovation exercises. The reasons for this are the wide ranging benefits produced by exercises and movement, including increased energy and focus. This is even truer when viewed through the lens of Traditional Chinese Medical. Dysfunctions of The Stomach and Spleen in TCM account for nearly every illness in some fashion. As the St/Sp creates energy, blood and governs both body and mind and the St/Sp LOVES to be stretched and moved. Exercise moves Qi and Blood and restores the proper balance of health. Of course, my exercise is based on Isometrics and Martial arts. A blend of cutting edge science and traditional wisdom....thus I get faster results than most people and with drastically less time invested. My whole workouts are finished in 4 minutes. Want more on that - start here. Fourthly, I exercise my mind as well as my body - Meditation is really important. Which is why you'll see it at the start and end of my day, and often in-between. The health benefits of meditation are well established. Start with a 5 minute practice and build up. Again this is a common thread in the most successful people and a foundational element of the koryu martial arts I practice. Essentially, it takes the most common letters and arranges them in the centre of the keyboard. Using this method, which takes about 2 hours to learn, I can type close to 250 words per minute. That makes me on avg between a 200-300% faster than using a typical QWERTY layout. In addition to be proficient at QWERTY it takes about 3 years. Dvorak, as I said, 2 hours. I read really fast and I recall close to 90% of what I read. I was not always like that. I learnt to do this using a system called photoreading when I was about 14. Today I burn through books and articles. Using photoreading to study a physical book I can read at close to 25,000 per minute. That's about a page a second. I once read all three volumes of the Lord of the Rings on the way into see the 2nd film. Terrible movie. (Controversial I know- don't hate me). When I'm on line I use a different tool that highlights the middle letter of any word and allows me to read SUPER fast. It's called Spritz and you can test yourself and get the app here. In about 30 seconds from now you'll be able to easily read at 2-4 times your current speed. You've seen above I spend a lot of my time in martial arts training - but that doesn't actually build a huge amount of muscle or fitness. Did you notice that little ten minute slot after my first article writing session. That's my workout. And in fact it takes me far less than 10 minutes. I measure my workouts in SECONDS not minutes. And I use Isometrics to achieve this. You can learn the same system I use to get in great shape with literally seconds of exercise right here - 7 Seconds to A Perfect Body. So now you have an idea of the success routine I use daily.....here's what I want you do next. Check out the links I've mentioned above. Come back here and post how you feel after a week below. I'll be looking for your comments and will keep you on track. You've been reading about the Success Routine. Check out my other motivating articles here.